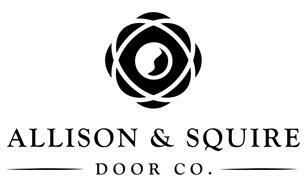 Allison & Squire Door Co. The smallest of details make your house a home, including the statement made by your handcrafted front door. Allison & Squire is a tenured carpentry firm, with over 10 years’ experience. We provide UK home and business owners with the standout door that welcomes your guests, and refines your design aesthetic. We cut, craft, stain, paint, and seal each of our doors by hand—ensuring your door is perfectly fitted! We can design standard front doors, double doors, and custom shapes and sizes. Choose a bold pop of color, a classic stain, or an elegant neutral that matches your exterior trim. Your door can complement or contrast with your Victorian, Contemporary, Twenties, or Regency architecture. Our solid wood doors are made from your preference of hardwoods including Oak, Walnut, Meranti. In addition to the sheer beauty of your custom door, our quality carpentry is an essential aspect of both home security and energy-efficiency. While exterior doors are our specialty, we are also available for interior doors and custom carpentry—such as windows, staircases, porches, timber conservatories, and personalised shopfronts. We are proud to be the go-to carpenter, and look forward to crafting a door that makes you proud!